The winner of the 3 free kits from Makia Creations is lucky number 5!! Send me an email and we'll get your kits out to you. Congratulations!! I was just scrolling around Flickr the other day, and was so excited to see some of the projects that you all have been working on!! 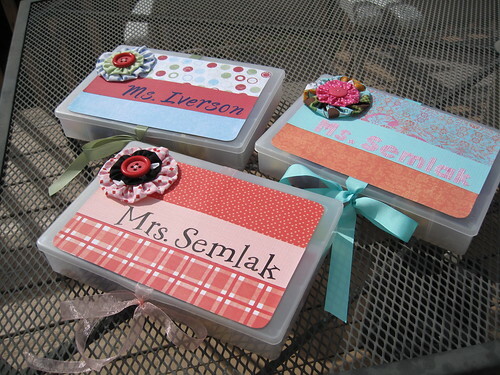 First up, some adorable School Supply Boxes by Ruthie T. They look great! 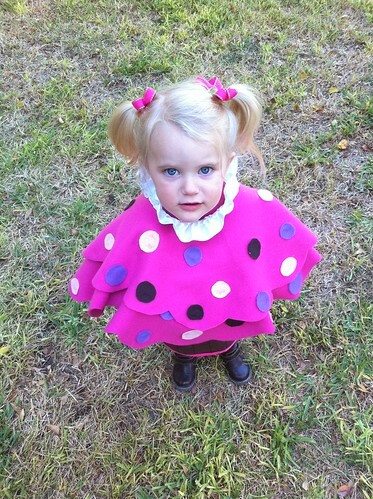 So many of you loved Patrice's No Sew Cupcake Costume, so I wasn't surprised to see a sweet little cupcake in the mix. 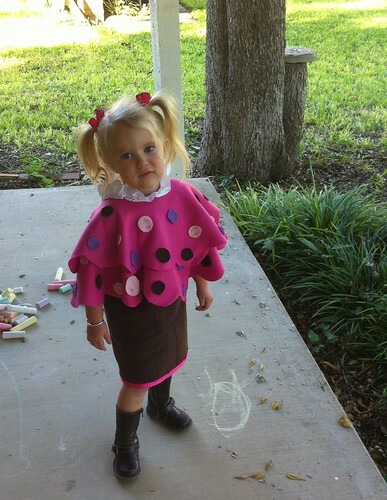 Franzie99 made this adorable version for her little sweetie! 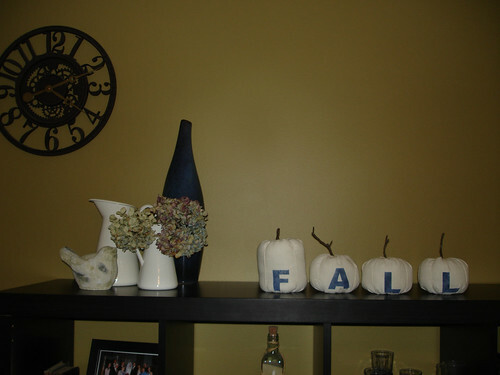 I was so excited to see that Alphabet Stew made herself some Potato Stamped Fall Pumpkins. They are perfect!! Have you made a tutorial from one of Lemon Tree Creations' tutorials? I will be honest and say that the project I have to share with you today is so simple, I am almost embarrassed to even share a tutorial on it! I made it a while back to serve a purpose in our office and never really intended for it to be a project. However, with the holiday's quickly approaching I started thinking it might make a nice simple gift for a friend or teacher, so here it is. An 8x10 memo board. The materials I needed for this project literally came from my scrap bucket. Left over fabric, left over batting, an old frame with a broken glass insert, and a folder. That's it! First I cut the folder down to an 8x10 size (I used a folder because it was sturdy as well as handy.) Then, I mounted the quilter's batting onto the folder using hot glue (of course!). Next, I cut the fabric to size and hot glued it to the folder over the batting as well. Finally, I used a regular black paint pen to add our initial and personalize it. Then I just simply popped it back into the frame. Simple, simple, simple. I found some decorative push pins at a local "everything" store and used my new framed memo board in just the right office spot. What do you think? Do you have any scrap fabric lying around that could be transformed into a last minute gift? My frame is a little boring, I can just imagine the possibilities if you actually went out and purchased specific materials! I'll be linking to these parties this week. Hope to see you there! I am so excited to show you brand new crafting company today! Allow me to introduce Makia Creations, which comes to you from the talented ladies over at How Does She? Have you been invited to one of Makia’s Craft Groups yet? A Makia Craft Group is a way for you to get together with your friends and have fun doing something you love: making things! 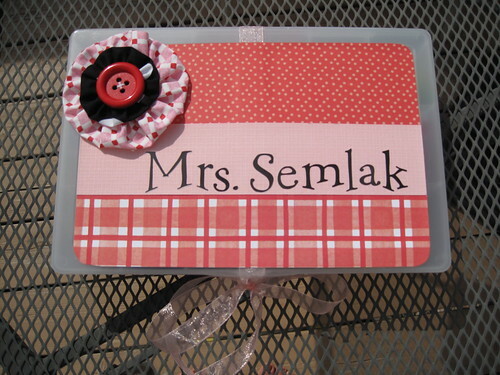 Makia will help you plan, organize and host a successful craft group by simplifying every step. We’ll introduce you to artistic crafts and provide you with ready-to-make kits. Basically your group shows up and gets to the fun stuff. Less measuring, cutting, messes and clean-up. In a Makia Craft Group you will enjoy escaping from the daily grind and household madness for a couple of hours and become part of a team that is passionate about creative home décor that is ahead of the curve. Makia makes it easy to host your friends for a fun, productive girls’ night out. Working as a group helps you save time and money on the kits and helps create a group where personalities and ideas come to life. Top 5 reasons for holding a craft group with Makia Creations? A productive girls’ night out! Get to the fun stuff faster! Check out Makia Creations’s website www.makiacreations.com to view innovative products and see how you can launch a Makia Craft Group in your area. To kick off their new site, Makia Creations is giving away 3 kits to one lucky Lemon Tree Creations reader - so you can have a mini-craft group session of your own. Sounds great, right?! To enter, just check out www.makiacreations.com and leave a comment on this post letting me know your favorite kit. The giveaway will close Friday evening and the winner will be announced on Saturday morning. Good luck! I can't wait to show off what I've made with my Makia kit!! Speaking of pillows, the next 2 weeks I will be sharing tutorials on sewing basic throw pillows. In Erin's first Shut Up and Sew segments, she had a ton of comments asking for pillow tutorials. You asked and you shall receive, my friends! Can't wait. See you next week! This pillow will be linked to these fabulous blog parties! I love projects like this. Fairly easy, but with a fun and beautiful result! First, grab your little sweetie and go collect some leaves. Encourage him to grab a variety of colors, and be sure to do a lot of stomping through the very dry ones! From here, the directions are simple. So simple, that I'm going to let the pictures speak for themselves. Fun, right? I love the addition of the fall colors around my home and the crisp leaf silhouettes. It also drags out the season of the leaves changing, which always seems to end far too soon for me. I've had these leaves hanging in my home for a few weeks now and they have barely lost any of their color. I imagine it will all be gone by mid-November, but I'll be ready for Christmas decorations by then, so all is well. I'll be linking to these fun parties! Are you up for some leaf garland for your home? Please share your results in our Flickr group! Congrats Jenna! Send me an email and I'll pass your information along and get you set up with one of those gorgeous stencils!! Halloween is second to my favorite time of year! The decorations, costumes, scary tours and yummy treats! Speaking of yummy treats..my edible bracelet can be transformed from eye candy to a snack at the end of the day (only if you dare). 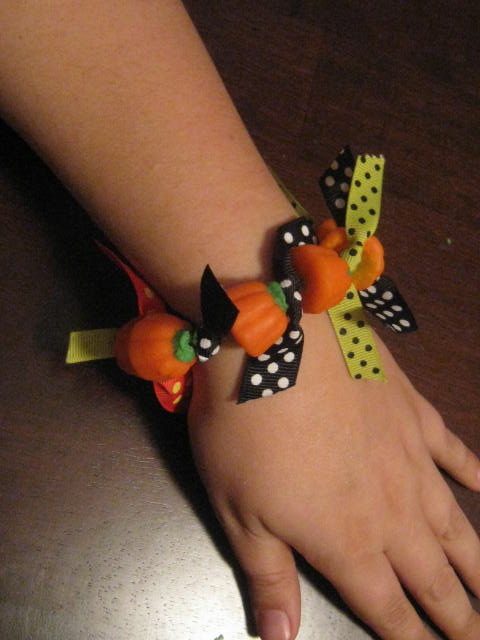 All you need is a few pieces of Mellowcreme Pumpkins, a needle and thread and some cute ribbon. 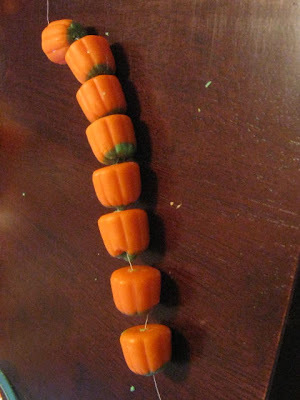 Begin by carefully threading the needle through the pumpkin candy. I used nine pieces for my particular bracelet (that might be me being stingy with the candy for a later snack..he..he). You can adjust your bracelet to the length you wish... possibly make a matching necklace! Once the candy has been threaded, you'll want to tie the ends together and cut your ribbon. Tie the ribbon in between each piece of candy. One or two pieces can be tied..depending on the space between the pumpkins. I also think this would be a great teacher gift, a nice addition to a treat bag, a cute wine bottle tie-on, a necklace as mentioned above or possibly a candle tag. I can't wait to see your bracelets show up on Flickr. Happy Friday Folks, don't forget to check out these other great blogs that I'll be linking up to. Have a great weekend. Shut Up and Sew: Burp Cloths and A Giveaway!